The total weight of plastic saved across the whole trial between Portugal and Brazil of 16 flights – 4400 passengers – was 1500 kg. 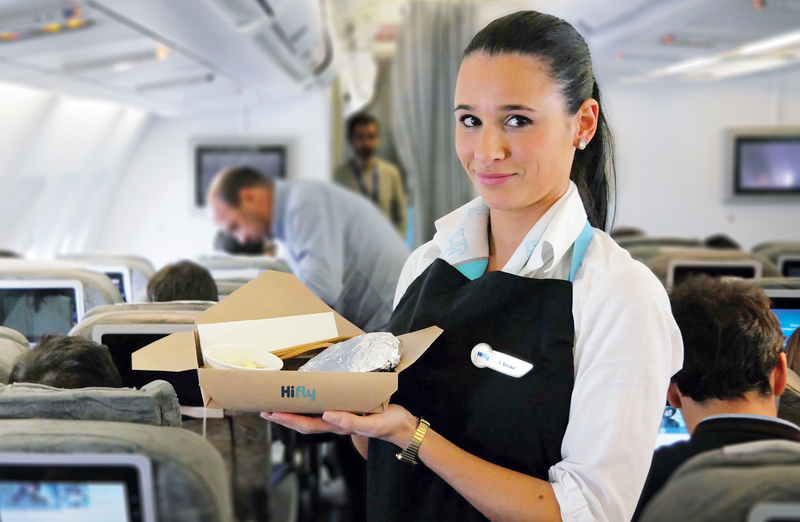 The Mirpuri Foundation is the principal sustainability partner of Hi Fly, the airline that operated the world-first single-use plastic-free flights, that have been hailed as a rip-roaring success by passengers, travel industry executives and environmental campaigners alike. The Portuguese wet-lease carrier replaced plastic cutlery with bamboo and cups, spoons, salt and pepper shakers, packaging for bedding, dishes, individual butter pots, soft drink bottles and toothbrushes were switched with compostable alternatives crafted from recycled material on a series of full passenger test flights to and from Brazil over the Christmas and New Year holiday period. The world’s first single use ‘plastic-free’ flight took passengers on a Boxing Day trip from the carrier’s base in Lisbon to Natal, Brazil, on an Airbus A340 and was followed by three further 100% single use ‘plastic-free’ test flights in addition to a series of 12 reduced plastic journeys between Lisbon and Oporto to Fortaleza, Recife, Maceió and Salvador. The total of 16 trial flights, are all part of Hi Fly’s long-stated commitment to be single use ‘plastic-free’ on all its flights by the end of 2019. Hi Fly President Paulo Mirpuri told assembled media agencies: “We are delighted that the test flights went so well. Seeing the reaction from passengers, full of smiles, and happy, even proud to be involved, only confirms to us that this is the right direction for us. The eco-alternatives used were plant-based catering disposables made from renewable, lower carbon or recycled materials, that can be composted along with food waste. Also, paper, card, pla&cpla, bamboo, chinaware, glass & stainless steel. Hi Fly Passenger Fabiano Silva, who was en route to surprise her daughter Mariana in Brazil for the New Year said: “It’s a noble initiative and one I think people would always support. I am happy to play my part. Hi Fly is the largest wet leasing specialist operating an all Airbus fleet. The EASA and IOSA certified and FAA approved carrier operates a fleet of large widebody aircraft, Airbus A330s, A340s the A380s, exclusively available for Wet Lease worldwide. Wet Lease – the supply of aircraft and crew, maintenance and insurance – is Hi Fly’s core business and has been developed with unmatched operational expertise for over a decade. The Mirpuri Foundation, the philanthropic arm of the Mirpuri family’s business empire has put the elimination of single use plastics front and centre of its key mission ‘to build a better world’. The Foundation was the principal sustainability partner of the 2017/18 Volvo Ocean Race and sponsored the racing vessel ‘Turn the Tide on Plastic’. The Foundation has frequently partnered with the Mirpuri-owned Hi Fly airline to promote its environmental campaigns and individual aircraft in the fleet are often liveried to support Foundation aims, such as the plastic campaign and in support of coral reef conservation.